What Are the Effects of Alcohol Use During Pregnancy? The term Fetal Alcohol Syndrome (FAS) was set forth by Jones and Smith in 1973. The French clinician Paul Lemoine had described a large group of children affected by alcohol exposure in pregnancy in 1968. Both publications identified a common pattern of growth deficits and dysmorphic features and proposed diagnostic criteria. In the reported cases there were abnormal physical and ocular features as well as neurological, cognitive and behavioral deficits. Since its delineation, physical features have been the hallmark for the recognition of FAS. Moreover, the pattern of physical features of FAS is today considered specific enough so that a diagnosis of FAS can be established even in the absence of confirmation of prenatal alcohol exposure (PAE). 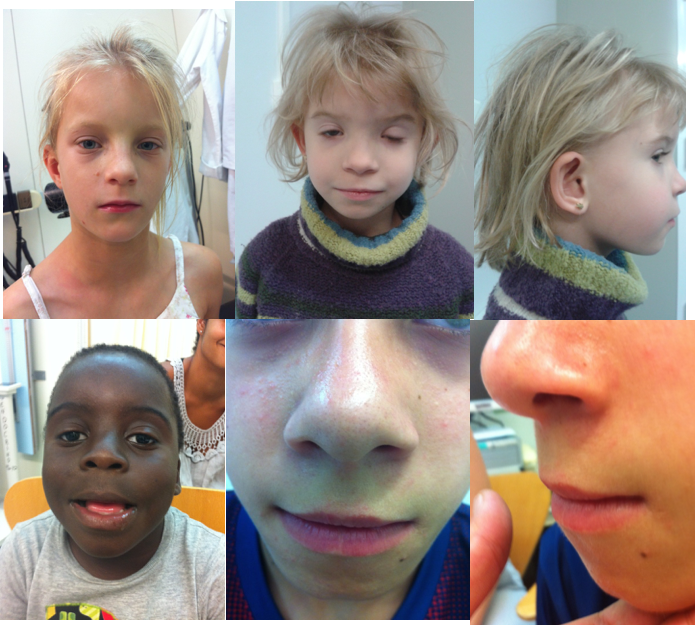 The pattern in FAS includes growth deficits (height and/or weight ≤10%), microcephaly (head (occipito-frontal) circumference ≤10%), and at least 2 of 3 facial features (short palpebral fissures below the 10th centile a smooth philtrum, and a narrow and poorly shaped vermillion border of the upper lip) (Figure 1). In addition, other dysmorphic features known to occur more frequently in patients with PAE include ptosis of the eyelids, epicanthal folds, midface hypoplasia, a short anteverted nose, a long philtrum, abnormally shaped “railroad track” ears, abnormal hand creases, particularly the hockey stick crease (Figure 2), limited finger extension (camptodactilies), incomplete pronosupination of the elbows, and contractures in other joints. Figure 1. The faces of FASD. A. Short palpebral fissures, normal philtrum pillars, narrow and linear vermillion, midface hypoplasia. B Apparent hypertelorism with normal measurements due to the very short palpebral fissures. Prominent epicanthal folds, bilateral ptosis. C. Midface hypoplasia and railroad track ears. D. Mild ptosis, short anteverted nose with long smooth philtrum, fleshy lips. E and F. Frontal and lateral view of the smooth philtrum and linear vermillion border of the upper lip that has lost the characteristic Cupid’s bow configuration. Midface hypoplasia. Figure 2. The hands of FASD. A. Hockey stick crease, absent proximal transverse palmar crease, normal thenar crease. B. Hockey stick crease, absent proximal transverse palmar crease, absent proximal interphalangeal crease of the 5th finger, limitation to extension of 4th and 5th fingers indicating mild camptodactyly C. Clinodactyly of the 5th finger D. Camptodactyly of the 4th finger. E. Bilateral camptodactyly of the 5th fingers. and F. Camptodactyly of fingers 3-4 and 5. A correct assessment of the dysmorphic features in FAS is part of a careful physical examination also aimed at differentiating FAS from other genetic and teratogenic conditions. Since the diagnosis often depends on the assessment of the dysmorphic features, this should be as accurate as possible. Measurement of the largest occipito-frontal circumference, as well as using the ruler at the correct angle for measurement of the palpebral fissures will be essential. 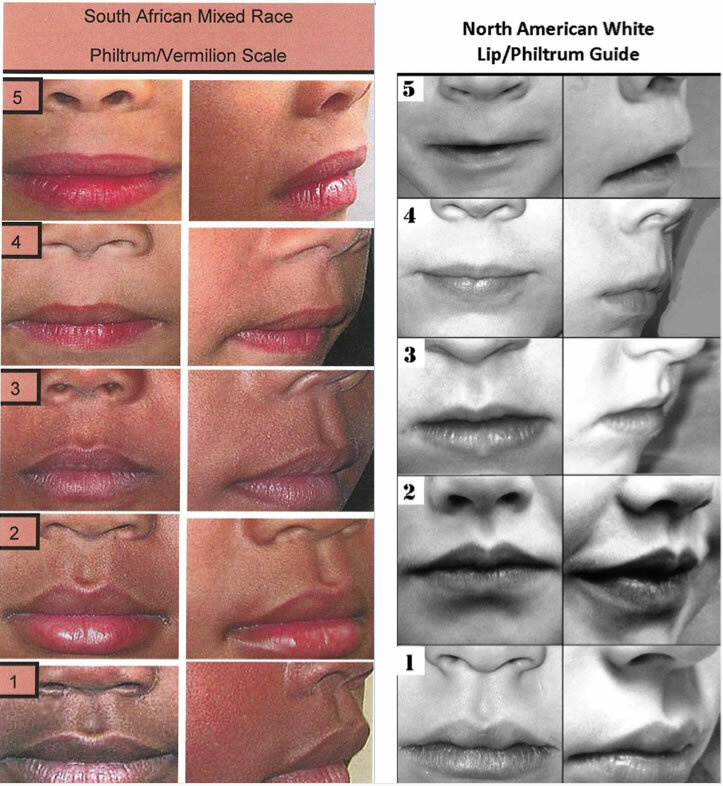 In addition, assessment of the philtrum and upper lip scores should be done with the help of a lip/philtrum guide, specific to the closest ethnic group if available (Figure 3). But most features are somewhat subjective, particularly for non-experts. A good method to improve recognition is to have pictures at the bedside with clear positive cases for these features. Many patients affected by prenatal alcohol exposure do not have all the physical features of FAS. Fetal alcohol spectrum disorders (FASD) is an umbrella term for the full spectrum of defects resulting from PAE. The term was initially set forth by the Institute of Medicine of the National Academy of Science in 1996 to include all features seen in children affected by PAE; years later it was clarified by Hoyme et al. in 2005 and again revised in 2016. Other diagnostic systems such as the Canadian guidelines and the 4 digit code, establish similar diagnostic categories with some differences in the details for each category. In FAS, microcephaly reflects structural damage to the brain. MRI findings show decreased brain volume and poor gyration, abnormal or absent corpus callosum, and small cerebellum. In addition, functional brain damage can become evident as seizures or abnormal EEG in addition to the presence of a characteristic neurobehavioral phenotype. Partial FAS (pFAS) identifies cases where either growth deficits or microcephaly and other forms of brain impairment are present, but not both, along with the dysmorphic features. Major malformations can also occur as a consequence of PAE, particularly heart, renal, and ocular defects. Hypoplasia of the optic nerve and refraction errors are particularly problematic for some of these children, all of which should have ophthalmology evaluations. In the presence of confirmed PAE, individuals with those defects will be given a diagnosis of alcohol-related birth defects (ARBD). The larger group of individuals with FASD, however, have cognitive and behavioral differences without recognizable features of FAS. In such cases, confirmation of PAE is necessary for a diagnosis. This diagnostic category is called alcohol-related neurodevelopmental disorders (ARND) in most diagnostic criteria and is somewhat equivalent to a new diagnostic category included in the DSM-5 called neurobehavioral disorder associated with prenatal alcohol exposure (ND-PAE). The definitions of ARND or ND-PAE are based on patterns of neurobehavioral differences assessed through comprehensive neuropsychological testing. These patterns include intellectual disability (IQ <70) only in a subset of patients. Most patients have other learning disabilities, impaired visual spatial abilities, and/or poor executive functions. These patients often have intelligence in the normal range but specific learning deficits will make it difficult for them to succeed in mainstream classes in school, as well as to understand and judge situations in daily life, or put in practice concepts they were taught. In addition, the neuropsychological profile includes a mood/behavior disorder with poor attention, anger outbursts, poor impulse control that reflect poor self regulation of their behavior. Finally, they show deficits in communication, social interaction and skills, and difficulties in motor skills, all of which are reflective of poor adaptive functioning. All these learning and behavior characteristics often result in secondary disabilities, including increased dependence on their family members and caretakers, social isolation, addiction to drugs and alcohol, and an increase in conflicts with the legal system. Decades of research have determined that brain damage in FASD is complex and multidimensional. Early animal studies revealed that development of the face and brain are intimately interrelated, as the brain provides structural, cellular, and molecular input that guides the development of the face. Studies in the mouse that began soon after the identification of FAS in humans provided the first experimental evidence that both brain and craniofacial abnormalities result from prenatal alcohol exposure and that the defects in the mouse are similar to those seen in humans (Figure 4). Striking changes appear in the developing brain in the rostral neuroectoderm, leading to decreased development of the neural plate and its derivatives, which account for the craniofacial malformations. These cells originate from the anterior neural ridge (ANR) at the rostral boundary of the forebrain. In addition to the ANR, neural crest, epibranchial placodes, and otic placodes are also affected. An underdevelopment of the medial nasal processes leads to the short nose, smoothness of the philtrum, and underdevelopment of the upper lip in FAS. Therefore, in individuals with FAS, the face somewhat reflects the degree of brain damage. Figure 4. A child with Fetal Alcohol Syndrome (FAS; a), an alcohol-affected fetal mouse (b), and a comparably-staged normal fetal mouse (c) are shown. Microcephaly, small eye-openings, a long smooth philtrum are seen in the baby and the exposed mouse. The characteristic facial features of FAS were induced in the mouse by maternal alcohol treatment only on gestational day 7, when the mouse embryo is at a stage corresponding to that in humans in the 3rd week. Modified from Sulik et al. 1981. Courtesy of Prof. Kathie Sulik, University of North Carolina-Chapel Hill. Besides direct cell toxicity of ethanol and its metabolite acetaldehyde, alcohol increases oxidative stress and leads to alterations in epigenetic imprinting, gene expression, and the generation of abnormal cell metabolites. Alcohol affects several genetic pathways, cholesterol homeostasis, neurotransmitter signaling, and has destructive effects on the cytoskeleton. No single or simple mechanism is responsible for the damage, and research evidence of how PAE causes brain damage suggests potential therapeutic targets to modify or reverse some of the deleterious effects of alcohol in brain cells. FASD is the leading cause of cognitive and behavioral deficits worldwide and is fully preventable. Prevalence studies have indicated that FASDs are frequent in all countries, in populations of all ethnic groups, and all socioeconomic levels. Studies in the United States have revealed as many as 2-5% of school-age children may be in the FASD spectrum. In well-studied, high-risk populations in South Africa for example, greater than 10% of children have FASD. Higher levels of alcohol intake as well as binge drinking are major risk factors for the infant being severely affected, but neither animal nor human research can ensure there is a safe minimum for alcohol in pregnancy. In addition, a critical period for major brain damage is the first trimester of pregnancy, often preceding pregnancy recognition. Therefore, all major scientific societies are now recommending to abstain from consuming alcohol in pregnancy or even when planning a pregnancy. Early diagnosis of FASD is of critical importance for the medical community and society in general. Infant early intervention and therapies are important therapeutic tools to improve the life of these children. However, a fundamental component associated with the diagnosis of FAS, is personal, familial, social and medical stigma, which often precludes correct and routine assessment of drinking of alcohol beverages during pregnancy, diagnosis of patients, and enrollment in early therapies. Several interventions have been proven to work for these children, and many trials for new approaches are ongoing. Early and correct assessment of these children can help improve their lives and the lives of their families. The numbers for alcohol consumption in pregnancy are high and do not seem to be declining. Therefore, continuous efforts should be made to promote awareness and to implement strategies for primary prevention, with the goal of eliminating this significant and costly health problem. K. Jones, D. Smith. Recognition of the fetal alcohol syndrome in early infancy Lancet. 1973 302(7836):999-1001. M. Del Campo, K. L. Jones. A review of the physical features of the fetal alcohol spectrum disorders. Eur J Med Genet. 2017 60(1):55-64. F. Calhoun, K. Warren. Fetal alcohol syndrome: Historical perspectives. Neurosci. Biobehav. Rev. 2007 31:168-171. A.E. Chudley, J. Conry, J.L. Cook, C. Loock, T. Rosales, N. LeBlancFetal alcohol spectrum disorder: Canadian guidelines for diagnosis. CMAJ Can. Med. Assoc. J/J de l’Association Medicale Can. 2005 172(5):S1-S21. H.E. Hoyme, W.O. Kalberg, A.J. Elliott, et al. Updated Clinical Guidelines for Diagnosing Fetal Alcohol Spectrum Disorders. Pediatrics. 2016 138(2): e20154256. H.E. Hoyme, P.A. May, W.O. Kalberg, P. et al. A practical clinical approach to diagnosis of fetal alcohol spectrum disorders: clarification of the 1996 institute of medicine criteria. Pediatrics 2005 115(1):39-47. R.J. Lipinski, P. Hammond, S.K. O'Leary-Moore, J.J. Ament, S.J. Pecevich, Y. Jiang, K.K. Sulik. Ethanol-induced face-brain dysmorphology patterns are correlative and exposure-stage dependent PLoS One. 2012 7(8): e4306. K.K. Sulik, M.C. Johnston. Sequence of developmental alterations following acute ethanol exposure in mice: craniofacial features of the fetal alcohol syndrome. Am. J. Anat. 1983 166(3):257-269. S.N. Mattson, T.L. Jernigan, E.P. Riley. MRI and prenatal alcohol exposure: images provide insight into FAS. Alcohol Health Res. 1994 World, 18(1):49-52. P.A. May, A. Baete, J. Russo, A.J. Elliott, J. Blankenship, W.O. Kalberg, H.E. Hoyme. Prevalence and characteristics of fetal alcohol spectrum disorders. Pediatrics. 2014 134(5):855-866. P.A. May, M.M. de Vries, A.-S. Marais, et al. The continuum of fetal alcohol spectrum disorders in four rural communities in South Africa: prevalence and characteristics. Drug Alcohol Dependence. 2015 159:207-218.